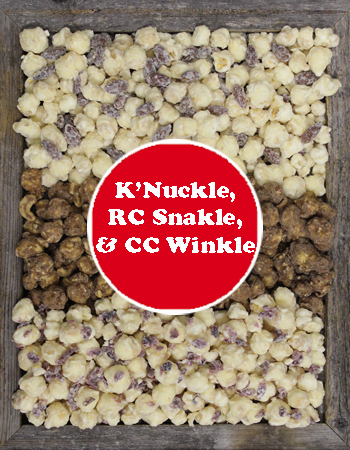 Get equal portions of our K'Nuckle - Popcorn in luscious White Fudge and Almonds * C.C. Winkle - Caramel Corn dipped in Fudge with Cashews * R.C. Snakle - Popcorn drenched in White Fudge with tart cranberries - Total of 61 Cups of Deliciousness!! Perfect Dessert Popcorn for Parties, Office Groups, Family Reunions, Weddings. Product arrives to you in bags, gift boxed with our signature packing.